Professionals the world over insist on using ICOM marine radios, known for their award winning performance, proven ruggedness and reliability. Icom America reputation is built on quality craftsmanship, reliability, safety, rugged construction and value. They offer a wide variety of marine communications and navigation products. Without question the Marine VHF Radio is one of the most valuable pieces of safety equipment on board. 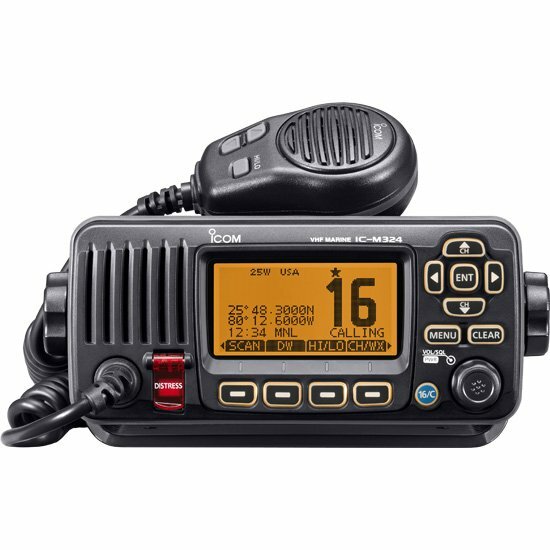 With channel 16 (for voice) and channel 70 (for digital DSC) being monitored 24 hours a day by the US Coast Guard, the VHF Radio can deliver a call for assistance, allow you to listen to the latest weather report, or simply keep you in touch with other boats on the water. ICOMs reputation is for setting the standards for everyone else to follow. Standards like Submersible construction, and Military Spec. Come on in and take a look at the industry's first FLOATING Hand Held radio. 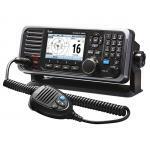 Icom pioneered the floating VHF marine radio and others followed. Setting a new trend with th.. Compact VHF fixed mount marine radio, black, MFG# M330 11, with large LCD, softkey menu operation, s.. Compact VHF fixed mount marine radio, white, MFG# M330 21, with large LCD, softkey menu operation, s.. Compact VHF fixed mount marine radio, black, MFG# M330G 31, with large LCD, softkey menu operation, .. Compact VHF fixed mount marine radio, white, MFG# M330G 41, with large LCD, softkey menu operation, ..
M424G VHF, black, MFG# IC-M424G 21, fixed mount w/ internal GPS, AIS interface, menu driven control,..
M424G VHF, white, MFG# IC-M424G 22, fixed mount w/ internal GPS, AIS interface, menu driven control,..
VHF handheld Marine Transceiver, MFG# M93D, 5 Watt transmitter, with built in GPS and class D DSC. F..
Icom M605 VHF without AIS, MFG# M605 11, fixed mount radio, 25W output power, 30W listen back hailer..
Icom M605 VHF w/ AIS, MFG# M605 21, fixed mount radio, with color LCD, 25W output power, 30W listen ..
A compact choice for boats that need a radio but don’t have room at the helm station. The M40..
Icom M506 VHF/AIS Radio with rear-mouint mic, MFG# IC-M506 41, Fixed mount VHF with built-in AIS rec..
Icom M506 VHF Radio with rear-mouint mic, MFG# IC-M506 31, Fixed mount VHF, 25/1 Watts, with built-i..